There are dream jobs and then there are job jobs. Working retail at a copy center likely falls in the latter. Even in a dead end job, there are politics that can heighten or hinder the promise of a future. 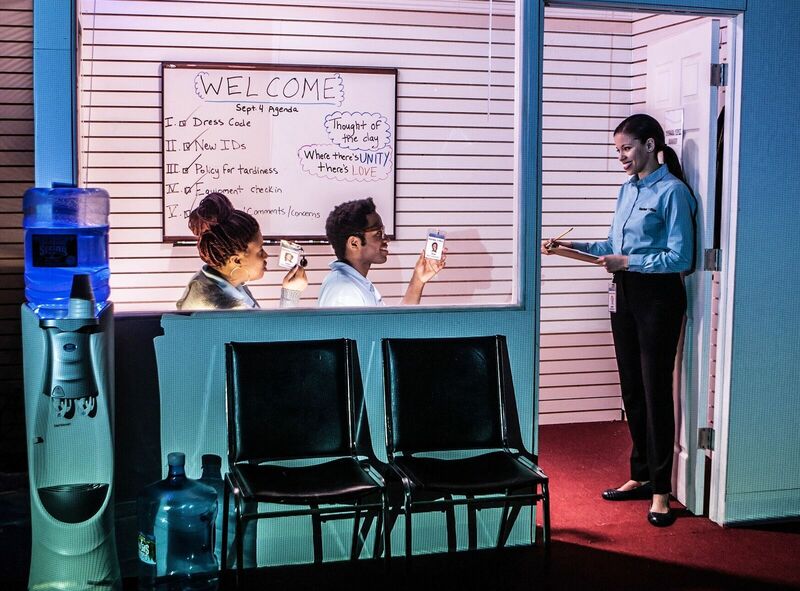 In James Anthony Tyler's absorbing Dolphins and Sharks, the employees of Harlem Office grapple with the struggles of morals in the workplace through the lens of race and gender. 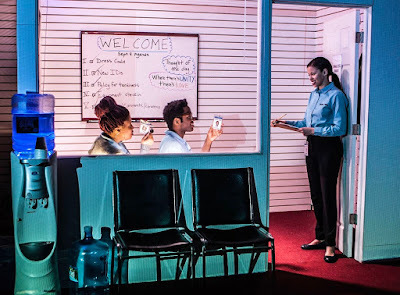 Presented by Labyrinth Theater Comapny, Dolphins and Sharks watches the rise of Xiomara from worker to manager as she fights for a better life, taking down anyone in her way. As Xiomara searches for a means to grow in the business, her best friends at work, Isabel and Danilo, try to get through the day to provide for their family with the philosophy of service with a smile. All while newcomer Yusuf, and his degree from NYU, attempts to bring in an incoming by any means. Rooted in realism, Dolphins and Sharks goes beyond workplace drama by offering detailed perspectives of growth in the retail world and how race, gender, and appearance may play a brutal factor. Tyler’s text is colloquial and realistic. He has a strong sense of character development and personal relationships, popping the nuances of the individuals. These are real people. You’ve met them before. You may be one of them. And that’s the strength of Tyler’s writing. Even with the stakes being perfectly high, Tyler could benefit with some shrinking. Dolphins and Sharks could be shorter to create a momentous ninety-minute one act. A scenic shift that could be worked into a transition shouldn’t warrant a two-act drama. So where can the cutting happen? The text that Tyler has written creates a gripping, white-knuckle drama. Where Tyler loses it is through the last moment as well as the two act opening beats. Director Charlotte Brathwaite’s staging of these moments is so chaotic they lose their importance and impact. To feel part of their world, Braithwaite enlisted the most realistic scenic design from Marsha Ginsberg. As you entered the theater, you were given the opportunity to poke around Harlem Office. The details of the copy center, from the computer playing “Pretty Woman” to the active pencil sharpeners, the vibe was alive. The one element of the design that didn’t get explored enough was the surveillance screen. Brathwaite had a missed opportunity here. Beyond that, Brathwaite’s vision was superb. The way she guided her company through the retail world while isolating the important themes allowed Tyler’s truth to hit a bit harder. While exploring naturalism, it was important to isolate sound in the manager’s office. In order for the audience to hear the conversations, sound designer Justin Hicks inserted a microphone inside. Additionally, Brathwaite’s staging was altered when someone stood in the doorway. Aside from the montages, this was one of the only instances that strayed from the style. While Kent Barrett’s lighting was dominated by the fluorescent lights, the pulsating color display during the transitions maintained the tempo of the piece. James Anthony Tyler wrote vibrant characters but this ensemble elevated them, drawing from truth. The inner turmoil of Xiomara gave Flor De Liz Perez to run the gamut. Having empathy surrounding each individual character, it’s easy to play Xiomara as the play’s antagonist but De Liz Perez’s complete performance allowed you to understand just why she did everything she did. As her store bestie, Pernell Walker as Isabel stood firm while still bringing flair and sass. In a way, Yusuf is an anomaly of a character. Chinaza Uche pulled out the uniqueness of the philosophical post grad through his quirks and loyalty. Like Xiomara, Yusuf’s battle inside was a central focus in Uche’s poised performance. James Anthony Tyler is a name that should be on your radar. Dolphins and Sharks was an exceptional showcase of his talent. Don’t be scared away by the premise of this show. The nuances within keep this play afloat.